One of the most popular go-to sources of drama in the Berman Trek era was the plight of the Maquis, the rebellious Federation-born colonists who often violently opposed Cardassian occupation. While they were created for Voyager, it was Deep Space Nine that introduced them to the world. But was it a strong introduction? 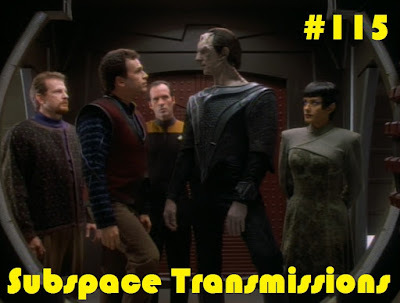 This week hosts Cam Smith and Tyler Orton put on their finest vests and revisit DS9's second season two-parter The Maquis to answer that very question, and explore how the presence of this disenfranchised group impacts key characters such as Sisko, Kira, Odo and Gul Dukat. In addition, the duo critique how well the Maquis were ultimately handled by Voyager, and whether it was a wise creative decision to leave the fate of Commander Calvin Hudson a big 'ol question mark. Wanna appear on the show? Shoot us a 30 to 60-second audio clip telling us your thoughts on THE MAQUIS and you could take the spotlight in an upcoming program! You can also send any other questions, topic ideas or feedback to subspacetransmissionspod@gmail.com! Join us next week as we celebrate FIRST CONTACT's 20th anniversary by talking Borg.